Easy to learn and easy to use, Staff Files gives managers and human resource professionals an efficient and affordable way to manage employee information. Store, retrieve and safeguard employee information in one place. Track wages, benefits, evaluations, training, time off and much more. Staff Files includes prepared HR letters and staff reports to export into PDF, Word, or Excel for print or email distribution. Download the free demo today! ...... in one location instead of sifting through paper file cabinets or multiple spreadsheets. Flexible reporting and printing options let you retrieve information from Staff Files in easy-to-read formats. Professional reports and letters are included, and you have the option to use data from the underlying Microsoft. 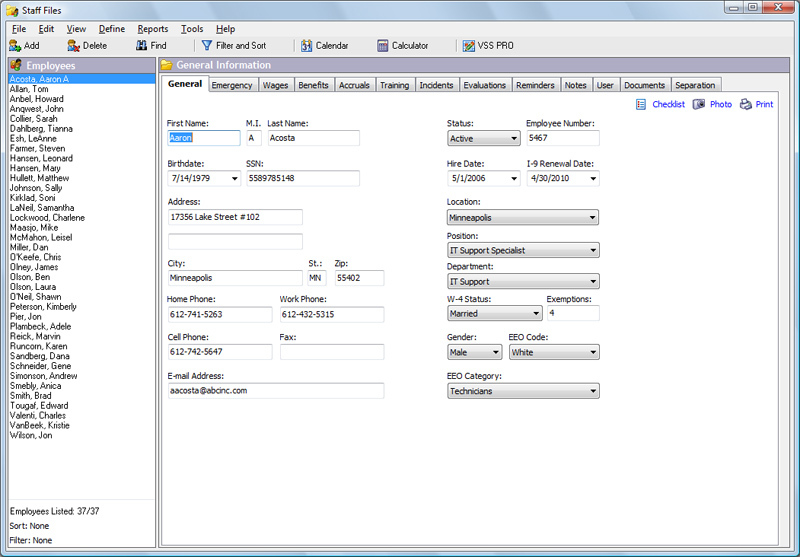 Access database for advanced reporting capabilities. Staff Files multi-level password system allows you to customize your own security levels. You can allow read or write access to all tabs, or restrict access to sensitive information in tabs, such as Wages, Reminders, and Evaluations all together. You can also set manager access to view information for a particular manager's department only. Qweas is providing links to Staff Files 7.0 as a courtesy, and makes no representations regarding Staff Files or any other applications or any information related thereto. Any questions, complaints or claims regarding this application Staff Files 7.0 must be directed to the appropriate software vendor. You may click the publisher link of Staff Files on the top of this page to get more details about the vendor.